My kids discovered Mad Libs for the first time this holiday and now I’m wondering what took me so long to introduce them! The giggles coming from the kids’ table are so, so cute. Not to mention, they now know the difference between a verb and an adverb, a noun and a plural noun. The kids have been playing with the Kid Libs version which are great for kids aged seven and up. And the nice thing about the game is that it can be played by as many people as you want. I’ve even caught Easton playing on his own and then laughing at his stories! We have a little road trip coming up this weekend and I’m planning on bringing a few Kid Libs with us in the car — I think it will be the perfect thing to entertain a captive car audience. 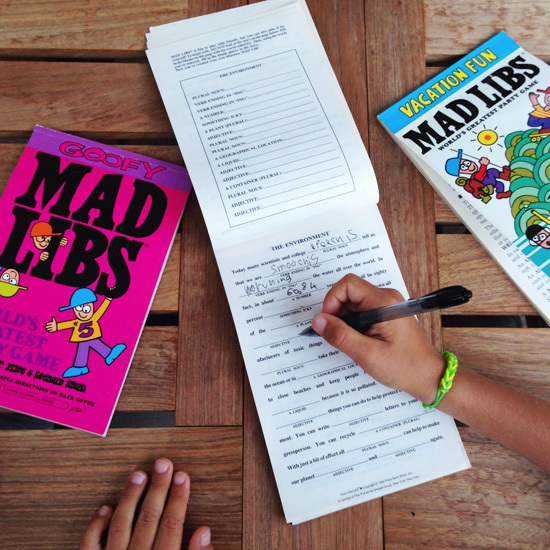 You can buy Kid Libs Mad Libs from Amazon (US and UK ). My kids 5 and 7 (and me) love mad limbs this vacation too! They even ask to do it instead of bedtime stories at night! My 5 year old need some help explaining but he laugh the loudest when we read the stories! So so cute! Even though Babyccino is a lovely website and blog with carefully selected contributions, I can`t help but wonder why you continuously support a company like Amazon, which with its socially highly questionable and exploitive tactics is rapidly bringing on the demise of companies (and bookstores!) which embody fairer values (like social responsibility to name only one) that in other posts are seemingly important to you too. I wish that with a following as large as yours you could be more aware of the responsibility that this entails, without having to employ a larger social agenda – and at least stop supporting companies that are contributing to large social and ecological problems.